Maurice Jackson of Proven and Probable sits down with Anthony Milewski the CEO and Director of Cobalt 27 Capital Corp. (TSX.V KBLT | OTCQX: CBLLF)which is a leading electric metals investment vehicle that offers direct exposure to metals integral to key technologies of the electric vehicle and battery energy storage markets. 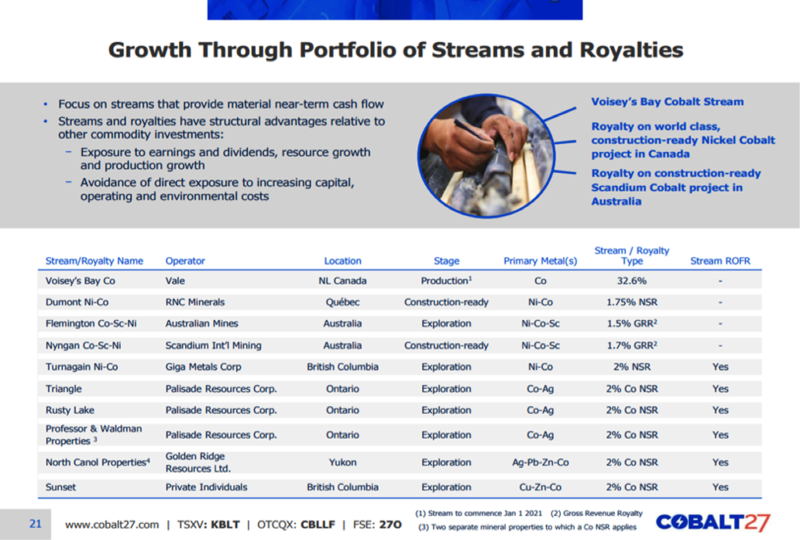 The Company owns 2,905.7 Mt of physical cobalt and has acquired a cobalt stream on Vale’s world-class Voisey’s Bay mine‎ beginning in 2021. Cobalt 27 is also undertaking the friendly acquisition of Highlands Pacific to create a leading high-growth, diversified battery metals streaming company. In this interview with Maurice Jackson of Proven and Probable, Anthony Milewski, chairman and CEO of Cobalt 27, discusses his streaming company’s prospects in the cobalt sector, as well as how the automobile and battery industries will affect the sector. Maurice Jackson: Joining us for conversation is Anthony Milewski, chairman, CEO and director for Cobalt 27 Capital Corp. (KBLT:TSX.V; CBLLF:OTC; 27O:FSE), which is a leading electric metals investment vehicle that offers exposure to metals integral to key technologies of the electric vehicle and battery energy storage markets. Glad to have you with us today to share the unique value preposition of Cobalt 27, which is a successful cobalt royalty and streaming company, in addition to providing shareholders a proxy to the metal. 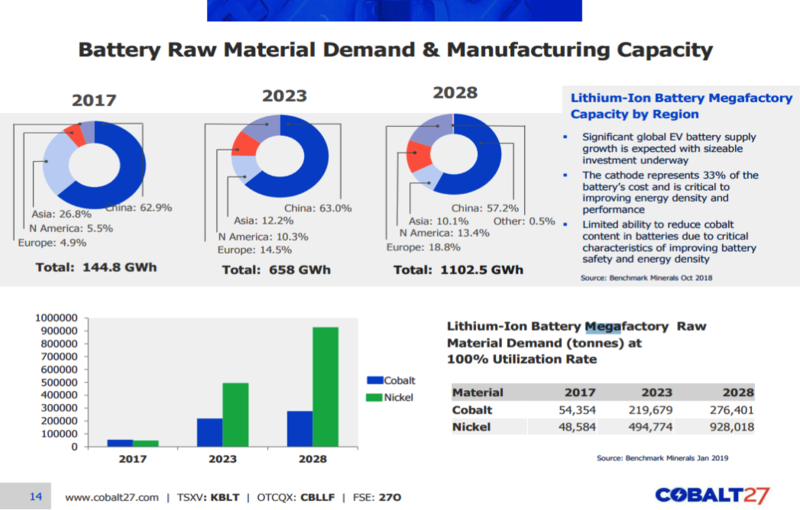 To really appreciate the context of today’s interview, Anthony, I believe it may be best that we provide a basic overview on the global demand for electric vehicles, in which cobalt is an essential metal. Anthony Milewski: I think we have to take a step back and look at what I consider to be two of the most important industries on earth, which are now sitting at the precipice of one of the biggest disruptions they’ve seen potentially in the last hundred years—namely the energy industry and the automobile industry. Today, 60% of crude is actually used in automobiles and in the automobile industry. Not only are you talking about a shift away from ICE [internal combustion engines] to electric, but you’re also talking about structural changes in ownership, with a ride-hailing services, autonomous vehicles, and a bunch of changes. These changes are dramatic and impacting a whole host of companies across a lot of different parts of our societies globally. At the heart of this change is the electric vehicle (EV). And the reason is that the electric vehicle has the sensors and the technology on it to put forward the platform for the next generation of changes inside of the automobile industry, namely autonomous driving and some of the other safety features being rolled out. To put in perspective that change, I believe we should remember where we’ve come from. And a few short years ago EV sales were effectively zero. I mean, literally, they were just this novelty item that you probably couldn’t even ride in if you wanted to. 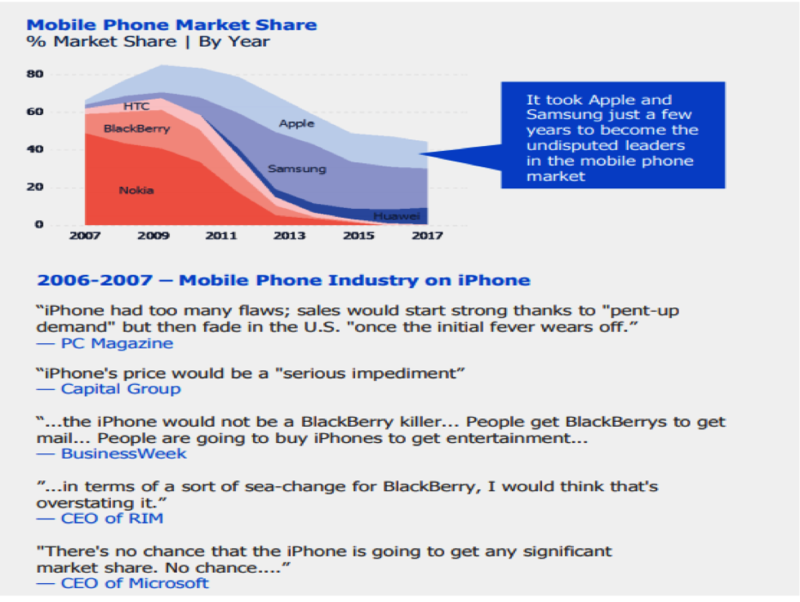 When we IPO’d about two years ago, we talked about 7% penetration in 2025 and even then we got push back. Now analysts are predicting as high as 20% to 30% penetration in 2025. Canaccord’s numbers are even higher than that in 2030. You’re seeing a dramatic increase in the rates of adoptions the analysts are looking at. To help get specific, 10% of car sales in November in California were electric vehicles, with similar numbers in Canada. That was driven, in part, by Tesla Model 3 deliveries. But the point is the acceleration of adoption has really happened in the last 18 months. And we’re seeing the automobile companies heavily push these vehicles, not only for the environmental aspects—namely cleaner air in large urban environments—but also because of the future of automobiles and the future of the automobile industry around autonomous driving and around automation. Maurice Jackson: This all bodes well for cobalt demand. Sticking with demand, cobalt is an essential metal in the manufacturing of batteries. 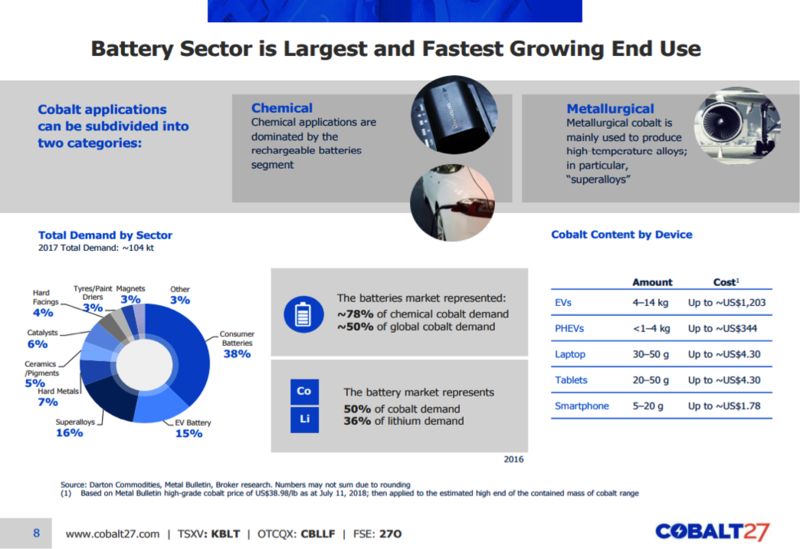 What has Cobalt 27 excited about the battery demand? Anthony M.: Well, each one of these cars has a battery. The cobalt market is anywhere from 105,000 to 130,000 metric tons of metal equivalent. And half of that demand today is actually batteries. Your laptop computer, iPad, just about any device that you plug into the wall and recharge it with the cord and then walk away has cobalt than it. That demand already exists. But the demand that has us excited is really the demands from the electric vehicle. 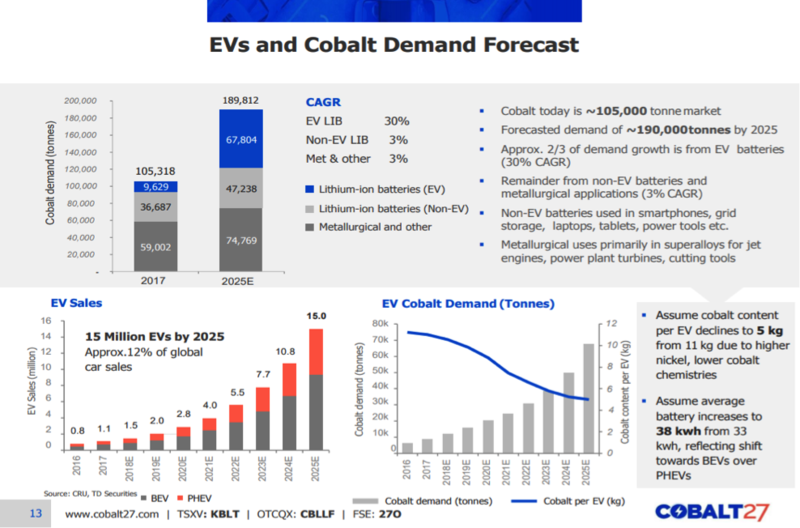 If I told you the market for cobalt today is about 135,000 metric tons, then let’s assume, at 20% penetration, you’re going to need something like 250,000 to 300,000 metric tons of cobalt just for electric vehicles. 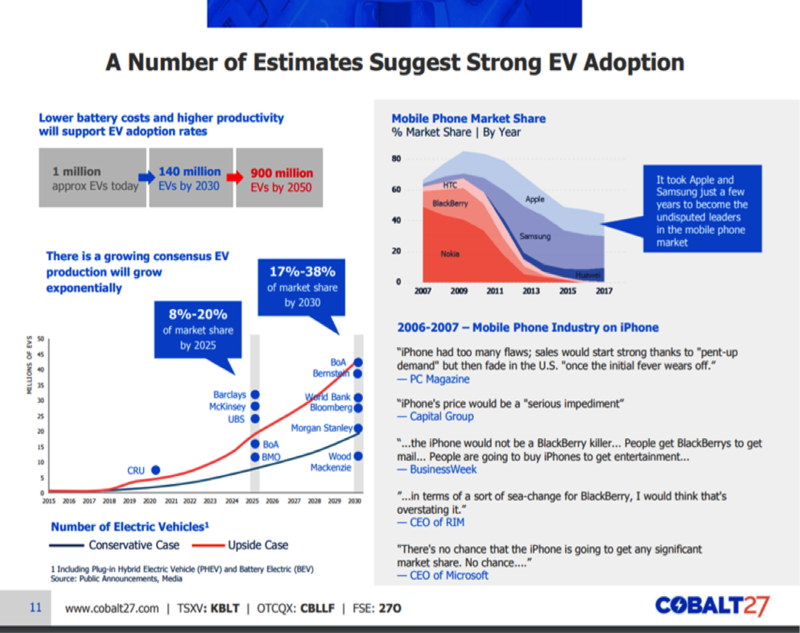 What you see is that as adoption happens, the actual use of cobalt grows exponentially. We’re seeing that happen as we speak with the adoption rates in sales of these vehicles. Maurice Jackson: In the U.S., investors are aware of Tesla’s gigafactory, but Tesla isn’t alone. How many mega factories are in construction? Anthony M.: Well, that number is interesting, because it’s changing all the time. In 2017 I think that number was 17. A few months ago it was 70, and even a few more gigafactories have been announced in the last few weeks. So the number is over 70 now. And even as recently as this month Tesla announced the construction of a gigafactory in China. But all of these automobile makers and battery makers have these factories slated to be built globally. One of the things about these battery producers is they aren’t particularly keen to be shipping them long distances. And so, unlike an automobile, which is highly consolidated in where it’s manufactured, what you’re seeing is a lot of different gigafactories being built globally around the world at a very quick pace. The pace is almost monthly. Maurice Jackson: Let’s move on to supply, to see how these factories will meet production. 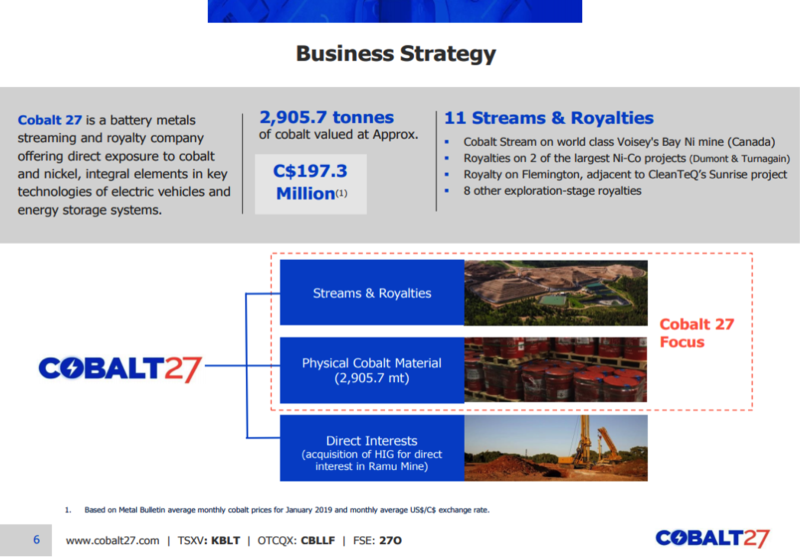 There are some concerning challenges on the supply side of cobalt, which really makes the value proposition exciting for Cobalt 27. Where and how is supply currently being satisfied? Anthony M.: It’s interesting. The geology of the world is such that over 70% of cobalt comes from Democratic Republic of the Congo (DRC). And by the way, it doesn’t come from the Congo. It comes from one little tiny area in the Congo. 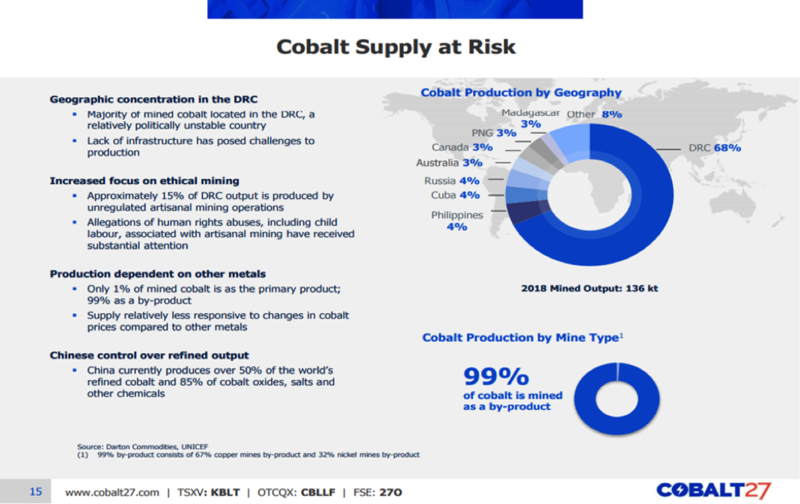 So one of the problems with cobalt is simply concentration risk. It comes from the Congo, where there are alleged human rights violations associated with mining it. And it’s tough. That’s part of the story and the balance of the story is that it comes from nickel outside of the Congo. So in the Congo it’s copper, and in the rest of the world it comes from nickel—in Canada and Australia, in particular, but also places like Russia and Cuba. Those nickel projects—not all of them, but many of them—are nickel laterite projects with enormous capex overruns. Now in the Congo it’s slightly different. One of the things that we’ve seen is the ability to have artisanal cobalt. The price of cobalt ran up to $44 and has now eased off, and it’s eased off in large part because of artisanal mining. Artisanal mining can mean different things to different people. It typically means that an individual is showing up and shoveling cobalt. That, in some cases, is actually legal in Congo. It’s not illegal, per se, although most of the time it is highly environmentally damaging. However, what the problem is in the Congo—or the allegations are—is that often child labor is used for that, in just not Congo. You have concentration risk and then you have supply chain risk, and you really have a need now from the automakers and the consumers and the battery makers to secure the supply chain and really be able to communicate to the consumers of automobiles that when they buy that car, the cobalt was ethically sourced and produced. Maurice Jackson: You referenced that 70% of cobalt comes from the DRC. From an off-take standpoint, how can manufacturers confidently rely on the DRC to meet their production needs? Anthony M.: I think it’s a real challenge. Obviously, there are companies like Glencore International Plc (GLEN:LSE) that are perfectly capable counterparties for the battery makers and cathode makers. But it’s a wider issue—and it’s an issue that’s being addressed and is going to have to be addressed going forward—which is how do you secure clean cobalt? I don’t think you can, if you are actually sourcing artisanal cobalt. But I think there are solutions that could be put in place to actually do that. I think today, if you are an end user, a consumer of cobalt, you really need to source that cobalt from outside of the Congo or from a mechanized minor. There was a great Wall Street Journal article about this last year. If you’re getting it from artisanal miners, I think it’s tainted. That artisanal supply’s aggregated at refineries and while one of the 25 sources may or may not be clean, if any of the sources are unclean, it’s all mixed and it taints all of it. I don’t think those challenges have been fully addressed, and I think if an automaker wants to actually be able to ensure that it can say its cobalt and its basic material pipeline are ethically sourced, they’re going to have to, for the time being, buy directly from mechanized minors or go outside the Congo going forward. They’re going to have to consider whether or not they’re prepared to invest directly into mining companies or create pretty different environments around the artisanal mining in the Congo. Maurice Jackson: You alluded to it, but just for confirmation, does Cobalt 27 have any offtake and or holdings in the DRC? Anthony M.: No, we absolutely do not invest in the Congo. We don’t buy cobalt out of the Congo. We don’t have streams or royalties in the Congo. From our perspective, we sit and we watch some of these large mining companies have problems in the Congo, and with multibillion-dollar market caps, and if they’re unable to successfully navigate that environment, I think it would be a challenge for us to think we could do that. So we’ve steered completely clear of it. I think that’s one of the offerings of Cobalt 27—conflict-free cobalt. Maurice Jackson: From a sovereign standpoint, which countries have a strategic stockpile of cobalt? Anthony M.: Historically speaking, the U.S. and China did, but the U.S. government sold down its stockpile over the last decade. Today China has the key sovereign stockpile—there are different numbers about how large that is. I think it’s a pretty material stockpile, but it’s not used for batteries. Cobalt is critical in the aerospace industry. And so the cobalt that the Chinese government has stockpiled is likely earmarked for jet engines and missiles and that type of thing, as opposed to batteries. Maurice Jackson: Now, from a manufacturing standpoint, which automakers have a stockpile of cobalt? Anthony M.: I’m not aware of any. I suspect there could be, but I don’t think publicly there are any. Maurice Jackson: Now, cobalt is a byproduct, primarily of nickel and copper mining. So how does the spot price of nickel and copper affect cobalt? Anthony M.: Well, over time nickel and cobalt have actually been fairly correlated. 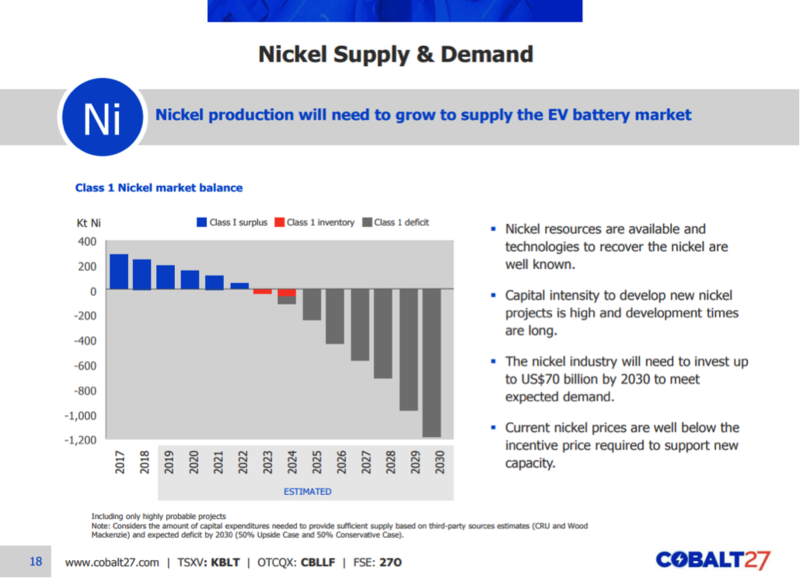 If you look, although that’s not been the case, certainly in 2019 as nickel was up 20-something percent and cobalt is down. But I think the key correlation is that over time, in order to get increased cobalt production, you’re going to need to see higher nickel prices and probably copper prices. Maurice Jackson: What is the current spot price of cobalt, and how is that in relation to the historic prices? 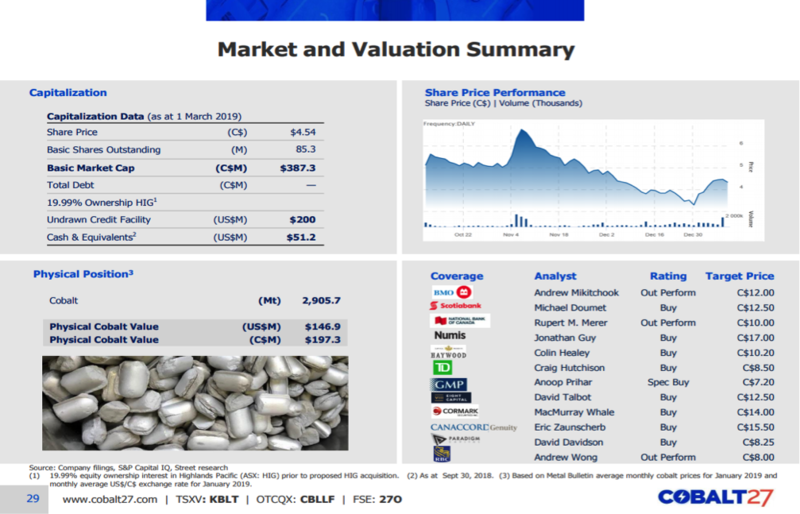 Anthony M.: Today cobalt is in the mid-teens. 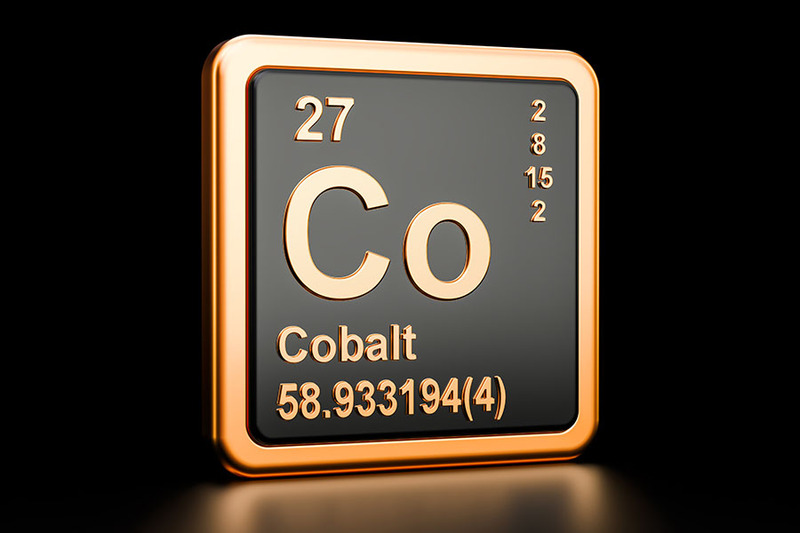 There are different types of cobalt. There’s metal. Even within metal there’s a high grade and low grade, and there’s a hydroxide. And so there’s a bunch of different products. But I would say it’s in the mid teens. It’s actually—right now—cheap. On the inflation-adjusted 20-year average, cobalt price is closer to $22. So cobalt is actually looking like a pretty strong buy as a metal at the moment. Maurice Jackson: For readers, we now see the value proposition we have before us in cobalt. Let’s discuss the value proposition we have in Cobalt 27 and how you may profit. Mr. Milewski, please introduce us to Cobalt 27. 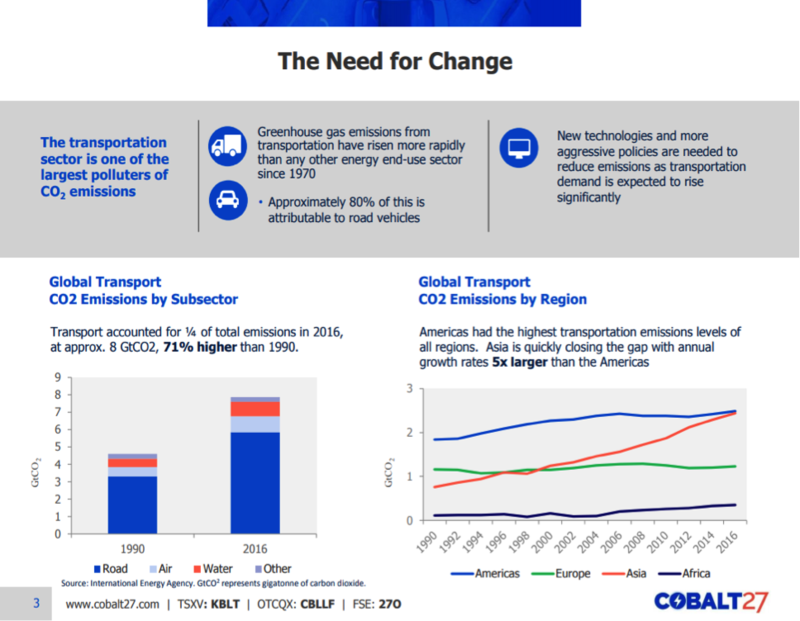 Anthony M.: Cobalt 27 is really a proxy for the adoption of the electric vehicle. 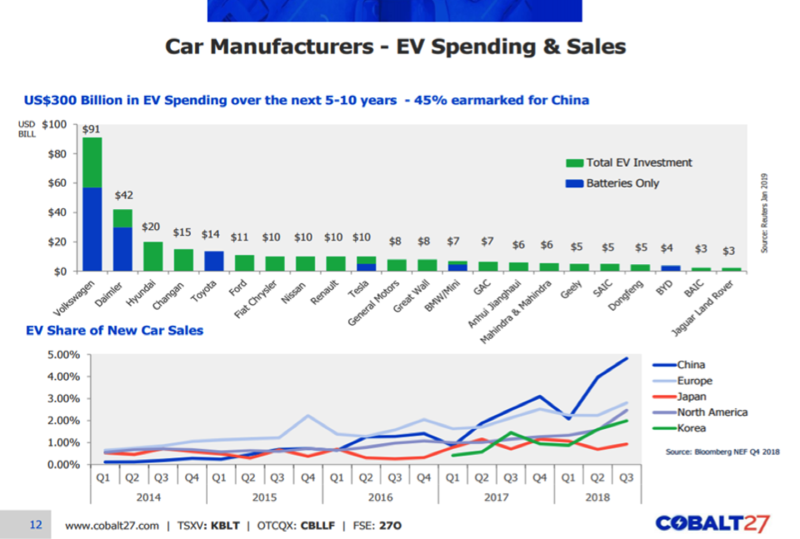 I don’t know who the ultimate winner’s going to be among automobiles—if it’s Tesla, Ford, or Beijing Auto. Maybe you should own a chipmaker—Nvidia. I don’t really know, but what I do know is if there is a winner, basic materials will be winners, and among those basic materials, we think cobalt would be particularly positioned to be a winner. 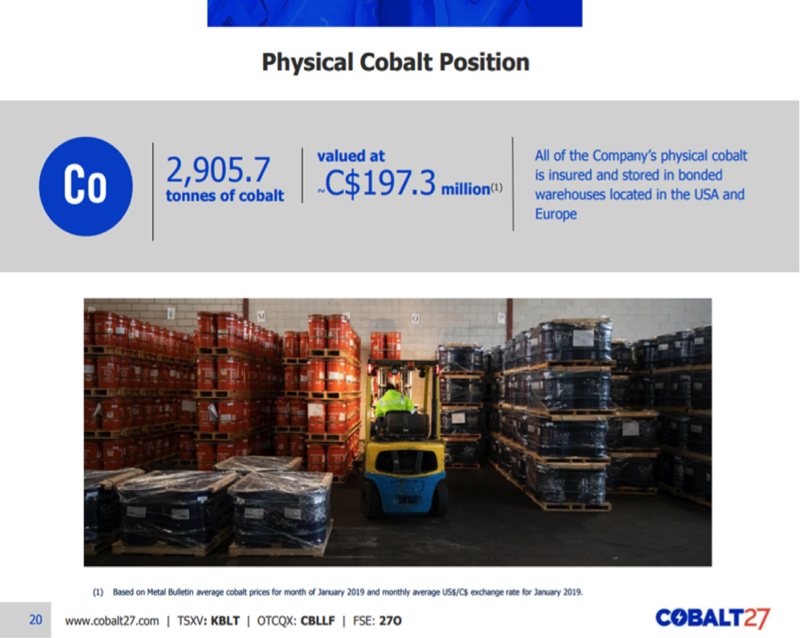 Cobalt 27 gives investors access to those price movements and the cobalt spot price in three primary ways. The first way is just we have 2,900-metric-ton stockpile of cobalt sitting in LME-bonded warehouses. The second is a basket of royalties on nickel-cobalt projects globally—large-scale projects that give the investor optionality. And then third, we have a stream on Voisey’s Bay in Canada, on its nickel-cobalt mine. We’re also in the process of completing a recent transaction on Highland Pacific to own a joint venture interest in the Ramu nickel mine. We’re not miners, nor are we going to be. You’re not subject to capex in the same way that you are with a mining company. Instead, what we try to give investors is really the maximum torque to that adoption and price move in the coming months, days, years, as the adoption of electric vehicles rolls out. Maurice Jackson: Now, were you able to procure your cobalt previously through streaming deals or how was that accomplished? Anthony M.: Cobalt 27’s streams and royalties are all financially settled, whereas with the physical, that was actually stationary. It is stationary so that was a purchase. But the nature of a stream is that you typically sell the material into the market as it comes in and then you take that cash flow and you pay a dividend, you buy back more shares, or maybe you make another investment. Maurice Jackson: Is the ultimate goal to set up offtake agreements with EV in battery manufacturers with your physical storage? Anthony M.: Look, I think there are two different kind of avenues that are being pursued. I think the first is just to look like a traditional streaming and royalty company. Look like a Franco Nevada or Wheaton Metals or Sandstorm, which is a very well-trodden path in Canada. You can get a multiple, in some cases, of over two times NAV. Today we traded a fraction of that. A second avenue, of course, is we’re building a supply chain for cobalt and to a lesser extent nickel, outside of the Congo, and through the cycle that’s going to be attractive to automobile makers, battery makers and other end users of these products. And so one could foresee the cycle, how we would get approached by individuals in different capacities to try to transact on what is clean material. Maurice Jackson: Switching gears, Cobalt 27 has strategically position itself for the upside potential in the clean air revolution in EVs and batteries. But equally important are the people that are responsible for increasing shareholder value. Mr. Milewski, please introduce us to your board of directors. 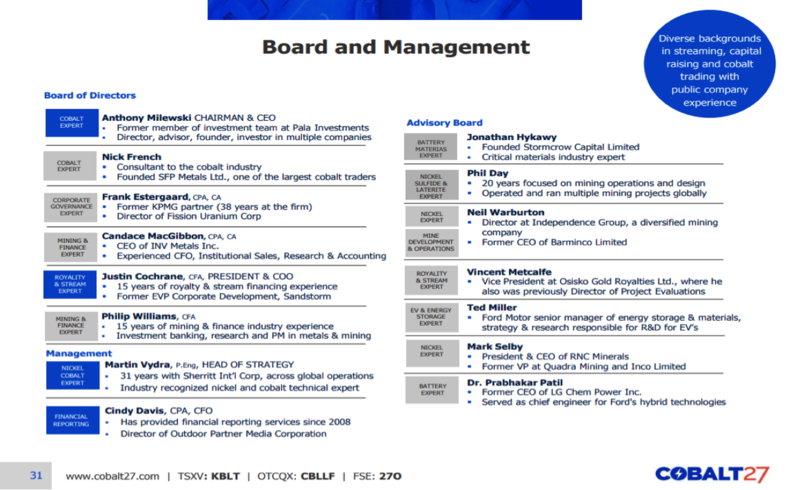 Anthony M.: Cobalt 27’s lead director is Nick French. Nick spent his career, since the early ’80s, late ’70s, trading cobalt. One of the most knowledgeable traders probably alive on the cobalt industry. And so he’s on the board. Frank Estergaard, a former KPMG partner, really adds a lot to the audit committee. Candace MacGibbons is a mining executive. She’s highly involved in the mining industry and understands a lot of the different aspects and concerns and transactions. Phil Williams, a banker—former banker who also runs a royalty company—is excellent in terms of just being able to look at transactions and financings and add to the conversation. Justin Cochrane, who is also the president and COO, spent a decade as a banker and in the streaming and royalty business, and then later went on to actually be one of the earliest team members of Sandstorm, and was critical there and ran the business development. Mr. Cochrane has been in the streaming and royalty business for his entire career. So Cobalt 27 has a really a strong board. Maurice Jackson: Tell us more about Anthony Milewski and what makes him qualified for the task at hand. Anthony M.: I think, in a lot of ways, one of the most important things that I can do it to help create value is make sure that we have the right team in place and the right strategy so that all the team members able to execute on that strategy. And so I really see myself as someone who puts forward that strategy, and facilitates Justin and Martin and the team members executing on that growth strategy, and executing on our strategy to really be a critical part of the cobalt and nickel supply chain going forward. Anthony M.: So the key members of the management team include myself, Justin Cochrane and Martin Vydra. Martin Vydra spent over 30 years at Sherritt, ran a bunch of different aspects of that business, and is incredibly knowledgeable on nickel, and nickel and cobalt. He sits on the LME cobalt committee, and he’s really industry veteran that adds a lot of insight for the business. Maurice Jackson: Let’s get into some numbers. Please share your capital structure. Anthony M.: We have around 85 million shares outstanding and no preferred shares. We’ve never had a financing with an attached warrant. We have some options outstanding to the management team. And then we have a revolver in place for $200 million USD, but we’ve not drawn to any of it. So it’s a pretty simple cap structure and that’s intentional. We try to keep it straight forward and simple. Maurice Jackson: How much in cash and cash equivalents do you have? Anthony M.: Approximately $50 million. Anthony M.: We have zero debt. Maurice Jackson: Who are your major shareholders and what is their level of commitment? Anthony M.: Well, I couldn’t speak to the level of commitment except that our shareholders have all been extremely supportive over the last couple of years and financings. One of them is Paula Investments, [others are] CI Harbor, BlackRock, Fidelity, and Neuberger Berman on the register. We have a pretty wide range of institutional investors who have been very supportive over the last year and a half, two years since since the IPO. Maurice Jackson: Are you a shareholder and if so, how many shares do you own and when was the last time you purchased? Anthony M.: I own around 400,000 shares and I purchased shares as recently as January and February. So big believer in the company and also in buying shares myself when the share price is priced as it is today. Maurice Jackson: Multilayered question—what is the next unanswered question for Cobalt 27? When can we expect a response and what determines success? Anthony M.: I think the next big moment for us is closing the Highland Pacific transaction. That’s anticipated later this spring. I think that will be a catalyst, that closing it will show that we were able to transact. It’ll also bring in a substantial asset, a producing nickel-cobalt asset. So I think that’s definitely the next big catalyst. That’s a few months away. And that’s heavily driven by regulatory matters in terms of court dates and voting and that sort of stuff. I think once we’re through that, the next big moment we’ll be thinking about cash flow and dividends and that sort of thing. I would say in the immediate term, the big moment for us is getting through the Highland Pacific transaction. Maurice Jackson: Mr. Milewski, last question. What did I forget to ask? Anthony M.: I think you covered it. You did a great job covering it, so I really appreciate your time. Maurice Jackson: Anthony, if investors want to get more information about Cobalt 27 please share the website address. Maurice Jackson: For direct inquiries, please call (647) 846-7765 or you may e-mail info@cobalt27.com. Cobalt 27 trades on the TSX.V: KBLT, and on the OTCQX CBLLF. Last but not least, please visit provenandprobable.com for Mining Insights and Bullion Sales. You may reach us at contact@provenandprobable.com. 5) From time to time, Streetwise Reports LLC and its directors, officers, employees or members of their families, as well as persons interviewed for articles and interviews on the site, may have a long or short position in securities mentioned. Directors, officers, employees or members of their immediate families are prohibited from making purchases and/or sales of those securities in the open market or otherwise from the time of the interview or the decision to write an article until three business days after the publication of the interview or article. The foregoing prohibition does not apply to articles that in substance only restate previously published company releases. As of the date of this article, officers and/or employees of Streetwise Reports LLC (including members of their household) own shares of Wheaton Precious Metals and Franco-Nevada, companies mentioned in this article. I enjoyed it don’t get me erroneous but take out the flying and you are left spamming two abilities over and over. If you are whatever other than colossus you spend at http://www.nx3corp.com/marketo-implementation.html half the time wallop behind a rock.